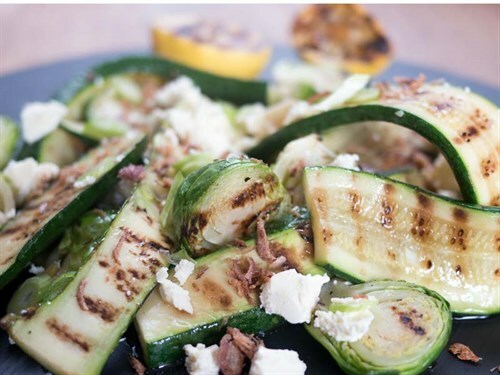 Check out this recipe for zucchini and brussel sprout salad with feta and chargrilled lemon. We love mixing up our salads, and in winter throwing together some in-season produce from the garden to create a hearty winter "salad". This is super simple and can be served warm or cold, the chargrilled lemon and olive oil in this dish is enough for the dressing. Teamed with ribs and potato skins… you can’t go wrong! Add halved lemons, flesh side down, and cook for 5 minutes. Remove lemons from pan, and set aside. Toss sliced zucchini with 2 Tbsp olive oil and ½ tsp sea salt. Pan fry zucchini on griddle pan for 1-2 minutes each side, until coloured. Set aside. Toss brussel sprouts in remaining olive oil, season, and place on pan, flat side down. Colour for 2 minutes then add ¼ cup water. Cover pan and continue to steam for 3-4 minutes, until tender. To plate, layer zucchini and brussel sprouts. Top with spring onions and crumbled feta cheese and top with fried shallots. Before serving, squeeze over the juice of chargrilled lemon. Masterchef NZ runners up Nikki and Jordan Shearer's latest recipe is for risoni and chorizo salad.